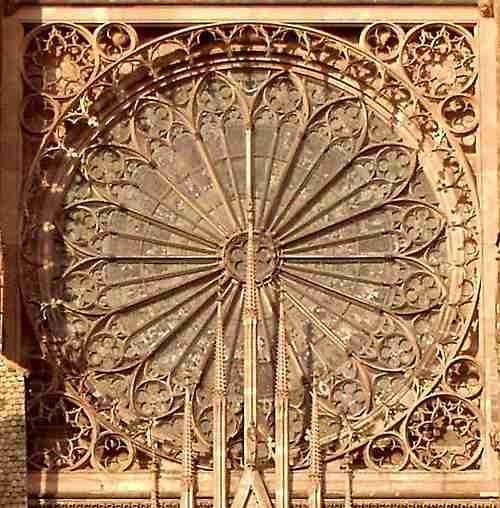 Have you ever looked up in awe, at something like this Gothic rose window, in the Strasbourg Cathedral. You would have to wonder how the hell they did it? No computers or calculators in those days. Truly awesome in the real meaning of the word. This image is courtesy of Wikipedia commons, I have not been lucky enough to visit Strasbourg. Well their main setting out tool was the trammel. The two trammel heads on the right when clamped to varying lengths battens can scribe arcs, divide lines, divide the circumference of circles and thereby define angles etc etc. (Note, the two in the photos were NOT used on Strasbourg, they just look like it :-) I know, I should clean up my tools, "so much to do, so little time". I am not real sharp at mental arithmetic, (not much better on paper actually) but with a trammel I can do remarkably accurate setting out. If you look at the photos of the trammel heads you will see that the points are not central to to the round steel pointed bars. The point is centered on one edge of the round bar, so that by rotating the bar slightly, very fine changes to the distance can be made. Above is a trammel that I was setting up to the width of a ceramic tile plus the spacer, to set out a bathroom wall. This is hardly necessary on small tiling job, but if you had something complex to do you might use a trammel. 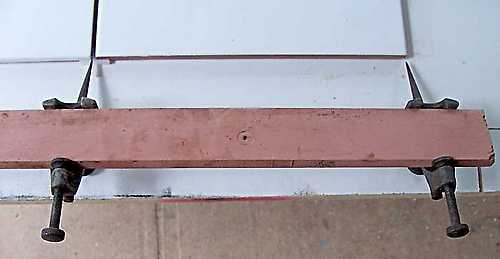 I have used a trammel like this to set out a length of batten to be used as a rod for setting out face brickwork, where we had a definite exact height to achieve, like under a concrete beam. Maybe I have a roof drawn to 1/6th scale on a sheet of MDF. I can set the trammel to the rafter length on the drawing, then do six steps of the distance directly onto a length of timber that will give me my true rafter length. Lets say that I am working out bush, and my calculator is stuffed. I could work out a stair by drawing it out full scale on a concrete floor, just a big triangle, total height, total going. This would give me my working angles to set up my steel square, but I would still need to divide the diagonal length into exactly equal parts. I would measure that length, and then I have to divided that length into the number of steps, say I have to divide it by 17 to mark out my strings. I do a rough mental division and get within 10mm. (Of course you guys that live in imperial countries will have already worked it out to the nearest 64th of an inch by this time :-). I get my trammel heads,and set them on a bit of skinny timber about the right distance apart, and mark off from one point to the next, pivoting around alternate points till I've done 17. Sure enough I was a bit out so I adjust the trammel head and do it again, until it is spot on. Then I do it again, this time making a small scribe mark with the point at each step. Easy peasy, how to divide a line into a given number of segments without even a tape measure. Trial and error it is, but extremely accurate, and fast enough. Now for the 99.9% of you that have read this far and don't have your own set of trammel heads, here's a tip. A length of batten with two nails driven through it is can be a trammel. Just bend the nails slightly to get fine increments. Easy. I have done this many times to scribe an arc or a circle for cutting large holes in cladding etc. You may have done the same, but you didn't realise that you had just reinvented a tool from ancient times. 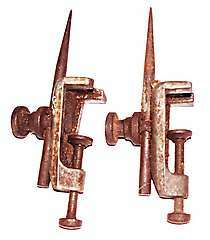 Leave trammel heads and back to hand tools. Other Miscellaneous Single Hints and Tips Pages.